Today’s post comes as an inspiration from an issue that my good cycling buddy faced last week. My friend, upon moving into his super-small studio apartment, quickly discovered that there was no space in which to store his bike. After moving his beautiful Cervelo into numerous corners of his 500-square-foot space, he was stumped. I hopped on my own bicycle, hit the road, and found myself searching for space solutions an hour later. Given that his bed, dresser, loveseat, and entertainment system were all crammed inside, it was certainly a challenge to figure out a storage solution for his most prized ride. Like with many of my Bart Haynes blog posts, I hopped online to seek inspiration. Luckily, there was no shortage of wonderful ideas on the Internet that ultimately provided us the most attractive and functional resolution. Before I share the end result, I’d like to share some runner-up ideas that I came across through Google. 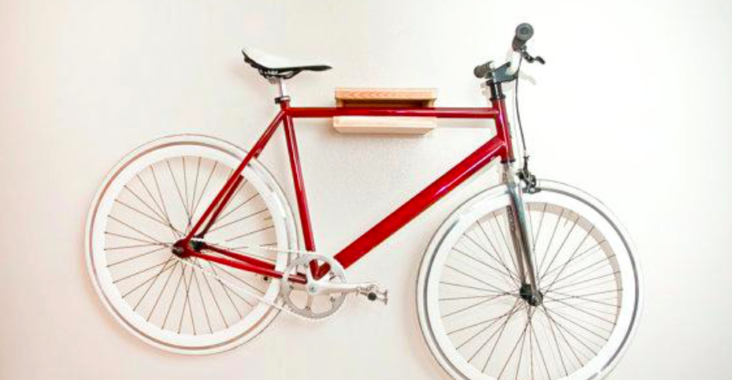 Hopefully, these photographs will motivate you to hunt for creative ways to display and store your bicycle as well. This design was a definite contender but ultimately failed to capture my friend’s winning vote due to its awkward look. “It looks like the thing’s going to fall down any minute,” he remarked. Even though this surely isn’t the case, I guess that this design just wasn’t his style. 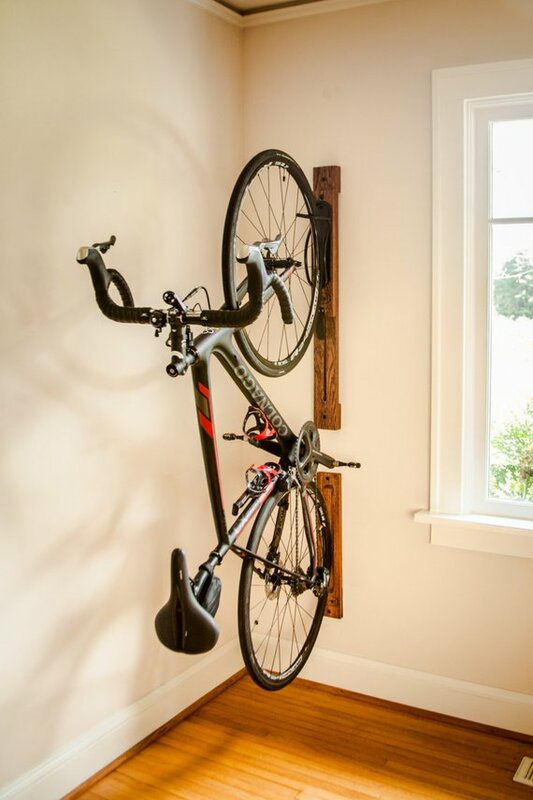 For many others, however, this could be a great way to display your bike and save space at the same time. 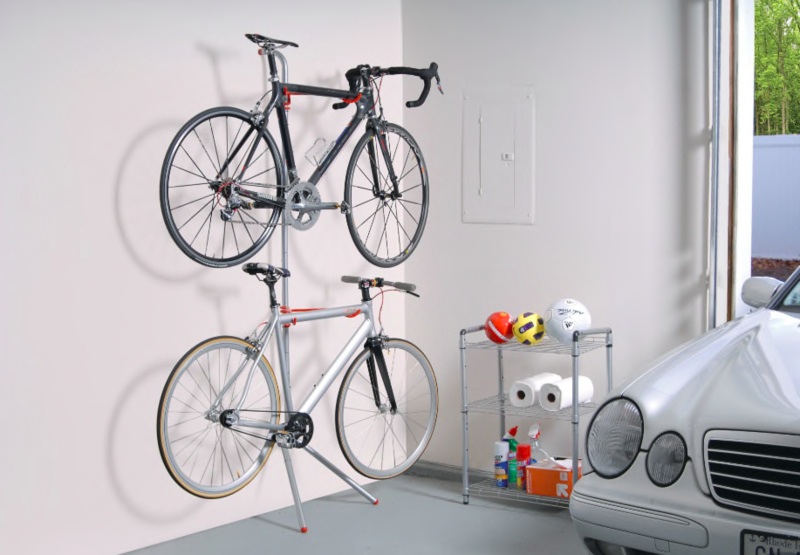 The next runner up features a great way to store not one, but two bikes if you so desire. This “Art of Storage ‘Donatello’ Steel 2-bike Leaning Bike Rack” is offered at the unbeatable price of $46.49, too, making it hard to say no to. Its description brags a fully adjustable rack that can hold two bikes with a combined weight of up to 60 pounds. It’s made of metal and steel and is pre-assembled for easy mounting. And what’s more, my friend only needed a storage solution for one bike. For those looking for a dual system, however, this may be the set-up for you! If we’re talking simply about price, this storage solution takes the cake. The Delta Cycle El Greco Ceiling Hoist Bike Storage, offered by REI, is being sold for a mere $25. This system features a pulley that helps to lift and lower your up to 5o-pound bike. It also is easy to install and is engineered to last a long time given its silver powder coating. Furthermore, the reviews are all pretty fantastic; no 1-star reviewers were left online for this product at all. Those who gave the glowing reviews found the pulley system extremely convenient and were also able to keep the bicycle off of the ground in small spaces. So again, the decision against this design was based on aesthetic. 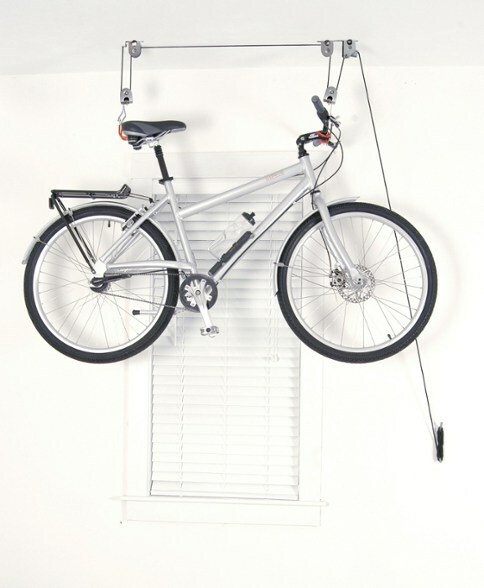 The Ceiling Hoist Bike Storage system seems to be very functional, but perhaps not everyone’s cup of tea in terms of looks. 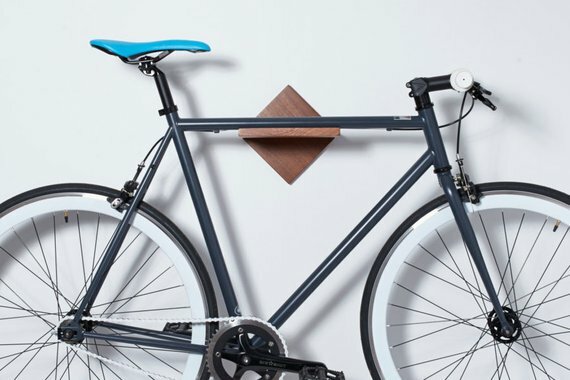 Finally, after much hemming and hawing, my friend made his final choice: The Wood Bike Wall Mount. This particular design was another Etsy discovery and fit my friend’s desires for functionality and attractiveness. Right away, he loved the minimalist design and thought that the diamond-shaped wood fit the aesthetic of his apartment well. Created by LomaLiving, this mount is sold in mahogany, walnut, maple, or tiger maple and is perfect in sizing for road bikes, fixed gear bikes, and track bikes. All that’s needed for the installation of this piece are two screws and it ships in just two days. Overall, I suppose that you have to consider your space, the functionality of the product, and your design aesthetic when choosing the right storage system for your bike. With a little bit of research, you’re bound to come across something that works best for you. Many thanks for reading and stay safe on the road!